This Bible is important for two reasons. First, it is beautifully written and signed by its English scribe, William of Devon, which is rare in the 13th century. Second, the illumination represents the first clear example of a wave of French (primarily Parisian) influence that played an important part in the development of English art from about the 1260s onwards. This influence manifested itself both in terms of style (for example the adoption of so-called 'broad fold' draperies), and iconography: the Psalm initials in the present Bible are almost entirely dependent on French rather than English traditions. 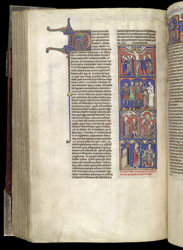 Facing the start of the book of Psalms are five scenes in compartments: the Crucifixion; the martyrdom of Thomas Becket; the identifications of the remaining scenes are uncertain, but probably depict the Virgin (dressed as a laywoman, and without a halo) instructing Becket to wear a hair-shirt; Christ appearing to Becket as he is reading; Christ before Becket as archbishop.